Today country music is an established part of everyday life in America. Yet in 1923, when the songs of unschooled white musicians were first heard on commercial recordings, the term "country music" was unknown, and the strong sales of early country singles surprised the New York recording executives who derisively called them, their makers, and their fans "hillbilly." To these promoters, the music evoked images of rural poverty and small-town morality quite at odds with the upwardly mobile urban Americans with whom they identified. But the fans didn't care much for the ill-clad old geezers, authentic though they might be, who were first offered by promoters, and it took thirty years of interaction between music promoters, music makers, and their fans to fabricate what came to be seen as the authentic look and sound of country music, an image of authenticity which, with his tragic death in 1953, became personified in the life and work of Hank Williams. 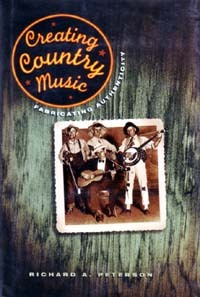 In this engrossing account, Richard Peterson traces the institutionalization of country music from the early days with Fiddlin' John Carson in Atlanta—which he shows could have become the center of country music production—using experiences from the lives and work of many of the genre's most influential performers, including the Carter Family, Jimmie Rodgers, Bob Wills, Gene Autry, Bill Monroe, the Delmore Brothers, Roy Acuff, Patsy Montana, the Girls of the Golden West, Ernest Tubb, and of course Hank Williams. The story, set in the era of the Roaring 1920s, the Great Depression, World War II, and postwar posperity, takes us from Atlanta and Bristol, Tennessee, through Charlotte, Chicago, Tulsa, and on to Hollywood, New York, and Nashville. Peterson captures the freewheeling entrepreneurial spirit of the era, detailing the activities of the key promoters who sculpted the emerging country music—Polk Brockman, Ralph Peer, George Hay, J. L. Frank, and Fred Rose. Along the way, the influence of car-maker Henry Ford and politician Joseph R. McCarthy are also noted. Vintage photographs of this cast of character add to the lively narrative. RICHARD A. PETERSON has been professor of sociology at Vanderbilt University in Nashville since 1965. He is the author or editor of nine books and over sixty journal articles on the sociology of culture.